Today I am going to share very Important post for Child Group Activity, means activity open inside Tab Group. For this I use Animated Activity. This logic I picked from stackoverflow.com. Hope it will help some one. 1)Create a new project, name TabGroupChildDemo. 2)Create an TabHostActivity and extend it to TabActivity. 3)Create 3 other activity name-HomeActivity, AboutActivity, ContactActivity. 4)Create 3 group activity name-HomeGroupActivity, AboutGroupActivity, ContactGroupActivity. 5)Create an other Activity ChildActivity.java. 6)Create 4 layout for Home, About, Contact, Child Activity, name activity_home, activity_about, activity_contact, activity_child. 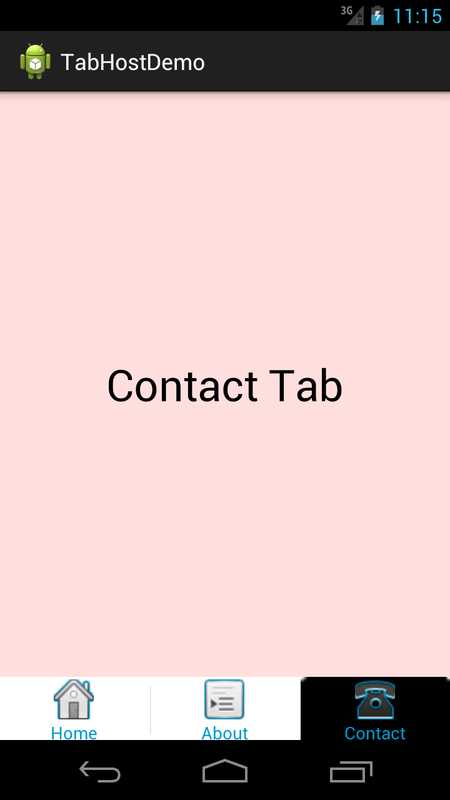 7)Create 3 other layout for display tabs- home_tab,about_tab,contact_tab. * Method used to re constructing the Views at tab bar. This solves tabs disappearing issue. I've bookmarked this for my future reference. I think I like the way that you have set up your tabs, over the way I have been doing (I've been using AndroidHive's tutorials for the tabactivity). But I guess your way makes a lot more sense to me as a person. Thanks for sharing your idea. I have no more idea about AndroidHive's But I think my way is very good. Hope it will help you..
TabActivity has been deprecated for a long time. Also, bottom tabs are inappropriate on Android. Yes you are right we can use action bar, pager, menu etc. But some time really we need these things on client demand. And I always write my problems and experience so when I will work on Action bar then sure I will publish. can you send me zip file. Hi Mathan Every thing is clear on my blog please copy paste the code..
Well I have sent you zip project please check..
pls give me the source code. Please don't mind just copy paste from above it is not much complicated.. I did not get where you got stuck? please clear your problem.. I would like to thank you, this is my first time talking to a foreigner. sorry for you because I can google talk incorrect. My problem is, when I add notes to EditText and TabHost that the bar is raised as shown. Hi I am unable to open your link its show This content is currently unavailable. will it work on 4.2 api version, actually i am using 4.2 api. AnimatedActivity is inbuild in sdk or we have to create AnimatedActivity for import. Actually AnimatedActivity is missing in my project. Please reply fast...my email: sohan.sharma339@gmail.com. I have no idea about inbuild AnimatedActivity but you should create your own like above demo.. I cant run the code... Error on animated Activity..
Can i know how to import the AnimatedActivty???? I faced a problem . When I was in the child activity and then change the activity and then again return to home activity , application close down automatically . Please Check now it will work, I fix that issue. Now check-out new code from GIT server..
ActivityGroup,LocalActivityManager and TabActivity..these are deprecated classes. when i pressed the home tab or switch the tab from others to home, it start the HomeActivity again . i do not want to get it restart every time i press the home tab. i want to launch the last activity(ChildActivity). how can i do that. can i override back button in ChildActivity. i was trying to override back button but it was not working. Hi Dileep, what you want to do exactly? 1) suppose you are on child activity and you press android hardware home button, that mean activity running in background, so if you open again it it should open child activity. 2)If you go out using android hardware back button then ofcourse it will destroy your app and will start from home tab. 3)if you want open another tab every time you can set it. but this is not possible i.e.- you leave from which tab its start from there. for that case you should get current tab when you leave your application and on launch override your tab preference. hi, i've a problem when i update the content of a tab, i don't want to refresh that! i want to UPDATE and mantain the content without reload that everytime! i don't know how to do that without use fragment and using your beautiful guide, so please tell me what i have to do! which content do you want update? do you have any list-view? It is a really useful tutorial. Thanks. Even I have to use Tabhost and bottom tabs because of client's demand. I have one question though. I want to display back button on the action bar for child activity inside the ActivityGroup. How is that possible? i think yes actionbar should work. if not work you can create a top bar in your layout. when you download any code from git-hub don't import just got through file menu in eclipse and then choose new option and after that from android option choose android project from existing code. Absolutely useful & truthfull demo till this date. Good Keep it up buddy. Thanks! Manish your post helped me a lot. Does the tabhost activity has to a launcher for this tutorial or it can be called from other activity with intent? You can use according to your requirement. You can make it launcher or open using intent from login or splash page. I am not sure please try to use instance of Activity/Application Context/ Context. Is there any way to do like that child activity from home tab remain unchanged after going to others tabs? 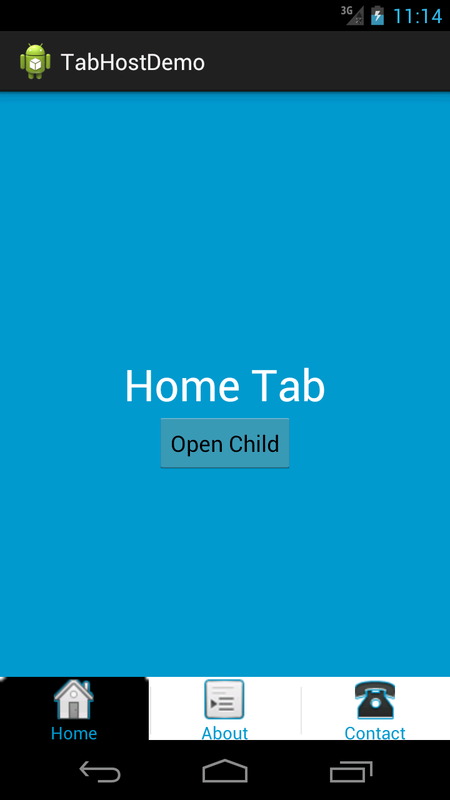 How to do change tab1 to tab2 when i click button that are place in tab1 scrren. So what will be write code on tab1 button onClickListner(). 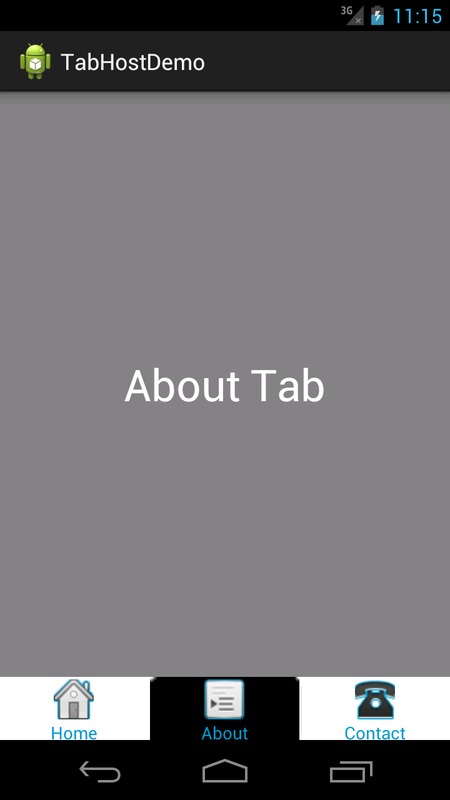 If i use intent to pass activity that code run perfect but activity are open at the upper side of tab.so tab are not display.